Vintage Belt Buckle, Vast Desert Landscape! Nice and Wide, Very Cowboy. 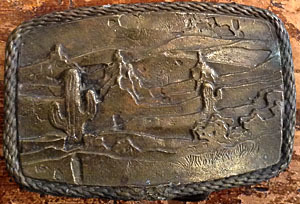 Home > Men's Accessories > Vintage Belts / Buckles > Vintage Belt Buckle, Vast Desert Landscape! Nice and Wide, Very Cowboy. 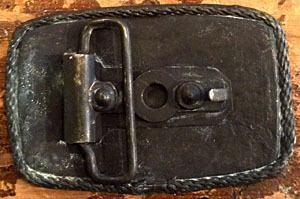 Vintage Belt Buckle! A vast desert landscape stretches out for miles, with cacti, mountains, and rolling dunes of sand. Super Cowboy, with a dark brassy finish and rope textured border! No text on the back. Condition: Very Good: Some patina spots, mostly on the back.